The groups in Hyderabad reflect this thought with each group following an ethos distinctly different from the others. The book enthusiasts of Turn The Page club. In the present era of social media, brief news, and short attention spans, book clubs in Hyderabad are daring to break the norm by celebrating the beauty of a leisurely long read. The trend is very much alive among several groups in the city which claim that the clubs not only bind its members together as a family but also serve as effective stress busters. Although intellectual stimulation, self-expression, and friendship happen to be the common thread running through them all, the impact of such clubs is actually far greater than meets the eye. Researchers in the UK have found that social groups, such as book clubs, could lead people to live longer and healthier lives within a certain demographic. The 2016 study, published in BMJ Open, explored the benefits of social group participation before and after retirement and found that people who maintained such social bonds after retirement were at a lesser risk of death in their first six years post-retirement. The groups in Hyderabad reflect this thought with each group following an ethos distinctly different from the others. While ‘The Dog Ear Society’ is a mixed bag of people who prefer to be known as a literature appreciation group, the gender equal group ‘Turn The Page’ comprises only couples. 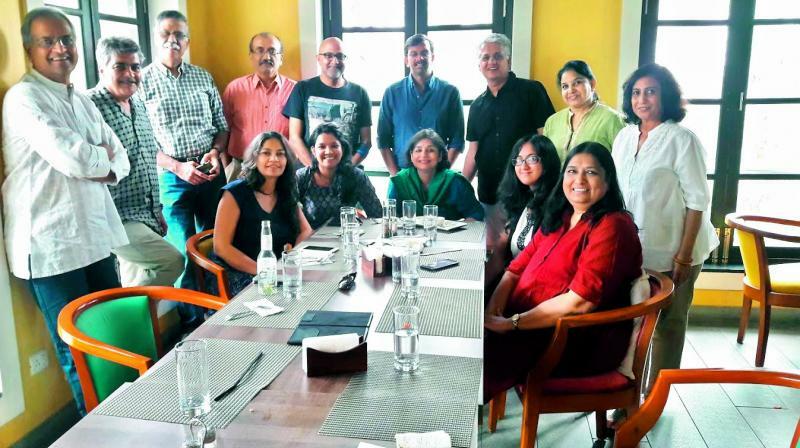 The ‘Bindaas Bakwaas Bookclub’, on the other hand, comprises only women. Mubaashir Ansari, who works in digital marketing and social media, funded The Dog Ear Society with his friend Anjali in 2012. He explained the model that his group runs on. “It’s not really a book club as we mostly appreciate literature, English and Urdu,” he said. Are book clubs becoming archaic? An ex-journalist and the founding editor of Jacaranda Press, Amrita Chak has since forever been involved with the written word. It was when she was hunting for a book club that the idea of ‘Turn the Page’ was born and eventually founded in collaboration with Sanjay Jesrani. The four-year-old club now has 12 member couples who meet once every month. As far as the all-women ‘Bindaas Bakwaas Bookclub’ is concerned, books seem to have added much more to their lives than just stories. Through the process of reading and sharing ideas, the group has now become a close-knit family. Kinnera Murthy, a member, said, “We laugh, we talk, we read. A lot of people prefer watching films over reading books. However, the written word is far richer in what it has to offer, I believe. For me, a book allows me to take a peek into the author’s mind,” she said. The group was founded on April 17, 2007 and comprises 10 members now all women with the youngest member being 49 years old and the oldest, 70. The 66-year-old Kinnera Murthy of Banjara Hills said, “We did not intend to form a women-only club but we got along quite well when it happened and therefore, decided to stick with it. We all have different personalities, temperament, and professions, but our love for books brings us together,” she said.